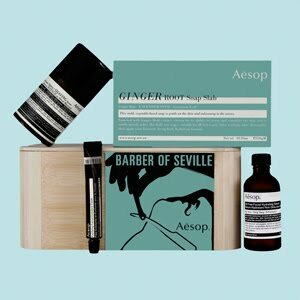 Aesop‘s opera-inspired packs are a great gift for Christmas. I gave my brother the Barber of Seville pack last year and he still raves about it. This reusable bamboo box is filled with lots of shaving goodies including the super dooper Moroccan Neroli Shaving Serum – which is so good that your man will never use anything else again (nor will you), Purifying Facial Exfoliant Paste, Oil Free Facial Hydrating Serum and the ever-lasting Ginger Root Soap Slab. Tip – I cut my Aesop soap slabs in half. They last longer and are easier to handle. This entry was posted in Uncategorized and tagged Aesop, Beauty, Christmas, Fragrance, Gift Ideas, Mens, Perfume, Summer by houseofturtle. Bookmark the permalink.